Asset bubbles are frequently popping up, and back down. They are easy to spot in hindsight, but we appear to lack the tools to recognize them ahead of time. 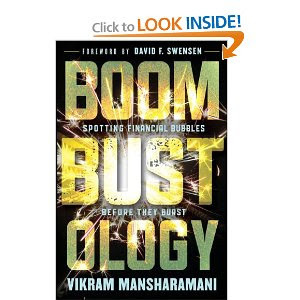 Vikram Mansharamani aims to rectify that with his book, Boombustology. He applies a multi-lens approach to understanding bubbles with the aim of giving the reader the ability to identify bubbles, and thereby avoid being caught unaware. Through the five lenses described in the book's first five chapters, this chapter describes the giant Japanese boom of the 1980s and its subsequent bust that is still with us today. First, some background on the boom. After World War II, the Japanese were conservative with their money, opting to save as much of their incomes as they could. The savings filled banks with money, which were then eager to lend it out. Incomes grew as the Japanese economy took off, but at one point asset valuations began to accelerate substantially faster than economic growth. By the end of the 1980s, real-estate in Tokyo was worth more than all of the real estate in the US, and Japan's Imperial Palace was worth all of the real estate in Canada! Stock prices also rose to ridiculous levels, with textiles, fisheries, services and marine transport industry P/E's trading at 103, 319, 112 and 176 respectively! 1) Microeconomic: Dynamics were clearly reflexive, as high asset prices fueled capital raises by banks which added to demand which in turn increased asset prices some more. 2) Macroeconomic: Low rates from the central bank along with a culture of savings filled up bank coffers with cash. Banks sought returns from pumping this money into the economy. 3) Psychology: Mansharamani argues that Japanese culture stresses community over individual. This in turn leads to a lack of contrarianism which can result in single-minded thinking. 4) Regulatory: A number of regulations helped both start and pop this bubble. There were high penalties for selling real-estate within 5 years of purchase, which created a scarcity of supply. Furthermore, estates which would otherwise be subject to high inheritance taxes could be offset by negative equity in real estate, created via leverage. This artificially increased demand for real estate. Aiding in the bubble's pop were new regulations requiring that banks increase real-estate loans as a lower rate than they do their overall loan portfolio. 5) Biology: The epidemic model suggests rampant "infection" of stock and real-estate fever. A number of individuals became stock market traders, and books on the stock market were bestsellers at the time. Bank Of America: Value Stock? LCA-Vision: Another Time To Buy? SuperValu's Gross Margin: The Lower The Better?